The Olympic and Paralympic Games were indeed made in Britain in 2012, but the Paralympic Games have their entire origin in Britain in the 1948 Olympiad, being the first organised athletic competition for the disabled in history. It was the brainchild of Dr Ludwig Guttmann of Stoke Mandeville Hospital in Buckinghamshire, whose aim “was to create an elite sports competition for people with disabilities”. The 1948 Stoke Mandeville Games or ‘International Wheelchair Games’ might have been an amateurish attempt to rehabilitate our war-wounded, and limited to those with spinal injuries to the exclusion of congenital defects, but it was a start, and it was a British initiative. Team GB’s Olympic medal haul in Rio 2016 was impressive enough, coming second in the world with 67 medals, 27 of them gold. Only the USA, with its population of 324,227,000, managed to beat plucky little Britain, with its mere 65,194,170 to select from. And Team GB’s Paralympians also came second in the world, with a quite remarkable 147 medals, 64 of them gold. Only China, with its population of 1,383,698,352, could beat our disabled athletes. 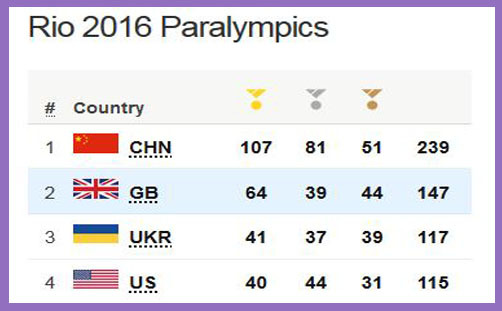 Indeed, the rest of the EU combined were hard-pressed to beat Team GB’s Paralympians, such is their greatness. A spirit of heroism has inspired a generation, not least in shifting the perception of disability from one of insurmountable hurdles and endless inconvenience to rich possibility and the heights of achievement. The disabled have become the differently-abled, or diffabled. They can race in wheelchairs, run with no legs, swim with no arms, play table-tennis with their mouths and football with no eyes. Closed minds have been opened; the impossible made possible; the inaccessible accessible. All you need, as Roy Castle used to sing, is dedication. It’s about the grit and determination to be the best. And God-given talent, of course. For the reality is that these diffabled athletes, with no eyes, no legs, dwarfism or multiple sclerosis, can still run faster, throw further, jump longer or swim faster than a good many of the ‘able-bodied’. And yet society deems it ethically permissible to abort them. Not all Paralympians are born that way, of course. Aged five, Jonnie Peacock contracted meningitis resulting in the disease killing the tissues of his right leg, which had to be amputated below the knee. Gaz Choudhry had a leg amputated at the age of 10; Jody Cundy lost a foot at the age of three. But Ellie Simmonds’ dwarfism, David Weir’s spina bifida, Hannah Cockroft’s cerebral palsy, Sarah Storey’s abnormal arm development– all of these would have been and are considered justifiable grounds for termination, with no upper limit. And if any of those who became amputees had been found to be lacking a leg or an arm in the womb, they, too, could have been aborted, right up to nine months, no questions asked. It is ironic that Parliament resists calls to legalise ‘assisted suicide’ on the grounds that those who are vulnerable through age or illness might be pressured into terminating their lives, while we send completely the opposite message to the disabled, whose lives may be freely and swiftly terminated in the womb. London 2012 was a summer like no other. But if “the best of mankind” is to have any enduring legacy; if, as Lord Coe said then, “we will never think of disability the same way”, surely we must lift “the cloud of limitation” on the thousands of unborn babies in the womb, whom providence has seen fit to gift with one leg, no arms, no eyes, dwarfism, cerebral palsy, Down’s or spina bifida. Who in God’s name can justify snuffing out the giftedness and limitless potential of these superhumans? As we watch these deeply impressive individuals parade in their victorious homecoming; as they blast away prejudice and we celebrate their diversity; as they receive in due course their peerages, knighthoods, damehoods and various appointments to the Order of the British Empire for services to sport, let us remember not only their spectacular personal achievements, but also the profound inspiration they are, the supreme pleasure they give, and the pride we feel that they have come second in the whole world, beaten only by a nation of more than a billion. And then ask why we are content to justify the ethical incoherence of the routine abortion of diffabled babies who might grow up to be just like them. And beaten by China, where baby girls are routinely terminated just for being girls.